President John S. Rendleman, J.D. Described in his obituary as "the colorful and sometimes controversial president of Southern Illinois University Edwardsville," former President John S. Rendleman was named to the post by former President Delyte W. Morris in 1968. His appointment was made in part to facilitate the decentralization of the SIU System. The U.S. was at war in Vietnam during the time Rendleman served in office. He publicly expressed his opposition of the war and supported open dialogue on campus, holding a campus convocation or "moratorium" on violence. His frank opposition to the war and promotion of discussion about what was going on in the country was attributed to helping prevent violent protests at the University during troubled times. When the SIU Board of Trustees wanted to do away with MRF after its first season. Chancellor John Rendleman was instrumental in making sure it continued, saying "We initiated this as a cultural experience, not a money maker." On the day after the shooting of four anti-Vietnam War demostrators at Kent State University, Rendleman held an open forum in the Goshen Lounge and responed to comments and questions from outraged students. It was under Rendleman's leadership that a second two-lane portion of South University Drive opened. During his time as the campus leader, the second floor of the Morris University Center-named for his predecessor-was opened. The Morris University Center at that time included the University Club restaurant, offices for nursing and business faculty members and the Meridian Ballroom. 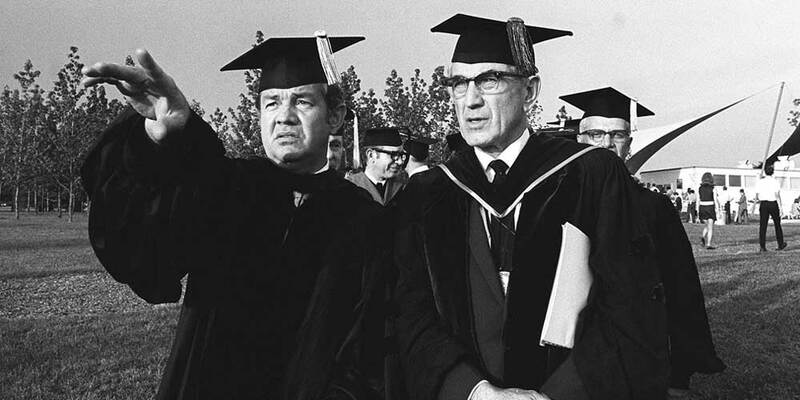 In 1971, Rendleman assumed the title of President. A year later he threw out the ceremonial first pitch at the dedication of the Cougar Field baseball diamond. Also during his tenure, the SIU School of Dental Medicine in Alton opened its doors in 1973 and received full American Dental Association accreditation in 1975. That same year, the initial phase of the first on-campus housing took place at then Tower Lake, now known as Cougar Village. It was during Rendleman's tenure that SIUE's academic units, which had been known as "divisions" were changed to "schools." Rendleman died an untimely death at the age of 48, succumbing to a seven-month battle with lung cancer in 1976, according to his obituary. A ceremony took place following his passing, naming the General Office Building in his honor. He had earned bachelor's and law degree from the University of Illinois, and taught as an assistant professor of government at SIUC, while acting as legal counsel. He became a protégé of former SIU President Delyte W. Morris and quickly climbed the SIU administrative ladder.